Augusta Me. Concrete Slab for Uplift, Inc. - Day's Concrete Floors, Inc. This Augusta, Me. concrete slab we installed for Uplift, Inc. will be a six unit apartment building designed specifically for people with disabilities. 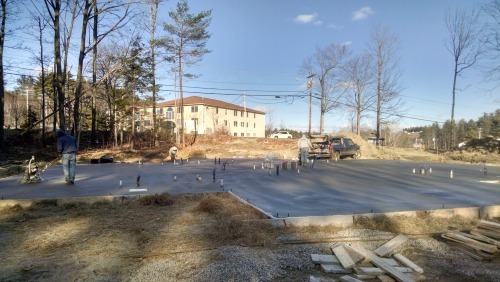 We've done a few of these concrete slabs for Uplift, Inc. One in Farmingdale, Me. and two have been in Gardiner, Me. Uplift designs these homes to support people who have significant medical needs as well as developmental disabilities. Although Uplift and the General contractor we are working for does pay us for our work, we're very proud to be able to help Uplift in any way we can. If you're looking for a concrete contractor that installs concrete slabs and floors in the Augusta, Gardiner, Hallowell and Farmingdale, Me. area just give Day's Concrete Floors, Inc. a call or request a quote. 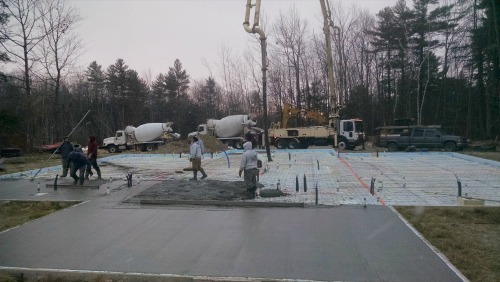 The main challenge for this concrete slab being installed in Augusta, Maine was the time of year the work is being done. We poured the slab on January 2, 2015. When we started pouring concrete at 7 am. the temps. were around 20 degrees F.
By mid-day the temperature reached about 33 degrees and the concrete dried just fine. We power troweled the concrete nice and smooth, sawed the expansion joints and covered the slab with blankets and hay. Above you'll see we're in the early stages of getting the slab ready. We've formed the perimeter with 2x12's and installed 2" Styrofoam. 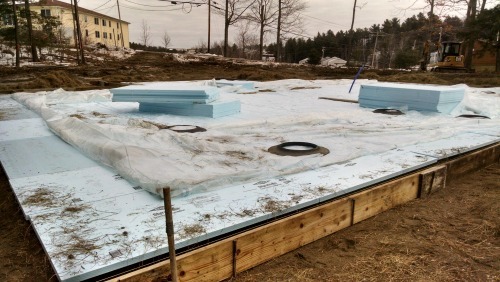 Radiant heat tubes will be installed on top of the Styrofoam to heat the concrete which will act as the heat source for the building. After the radiant heat tubing and all the plumbing was in place, we poured the concrete slab. The slab, about 4700 sq. ft., took 91 yards of concrete. As you can see, we used a pump truck from Mainly concrete pumping to assist us in pouring and Sargent Materials supplied the concrete. 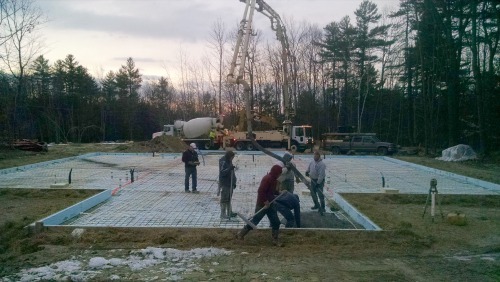 I had a 7 man crew there and although it was cold, we were done pouring the slab by 9:30 am. 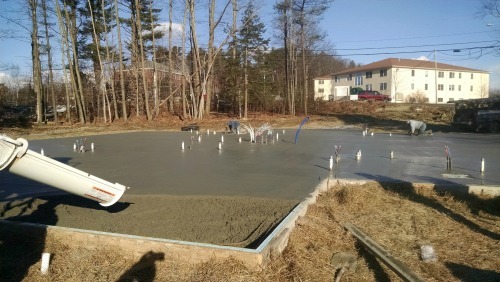 Augusta Me concrete slab - Almost done! We're just finishing up the pour and a couple guys are already back on the slab smoothing the edges and around the pipes. This concrete slab will eventually be home to 6 apartments. That's a lot of bathroom and kitchen pipes to finish around!! Here, we're power troweling the surface of the concrete nice and smooth. Although it was only about 33 degrees, it was nice and sunny. The sun helps the concrete dry, we were done troweling by about 3:30pm. 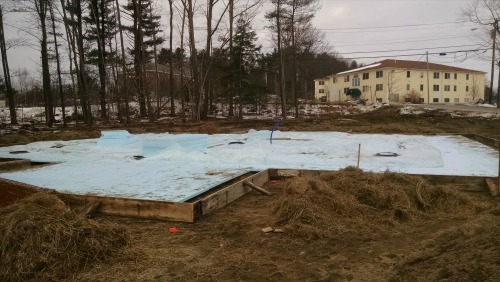 To protect the slab from freezing, we covered it with special blankets made for concrete then covered the blankets with hay and a tarp. After about a week of being covered, the builders (B.H. Builders owned by Brad Hendrickson) can start building.